In mid-February, the United Auto Workers lost a crucial unionization vote at a Chattanooga, Tenn., Volkswagen auto plant. 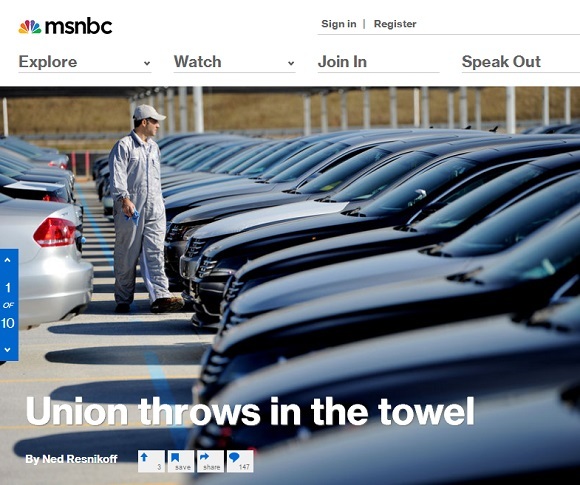 Rather than licking their wounds and accepting the outcome, a slew of liberal pundits, including MSNBC's Ed Schultz, cried foul and agitated for the United Auto Workers to call on the federal government to essentially insist on a do-over election, predicated on the notion that pro-right-to-work politicians tainted the vote by their public pronouncements on the election. UPDATED: The United Auto Workers (UAW), the union which recently lost a vote to unionize Volkswagen employees in Chattanooga, Tenn., withdrew its legal protest against the outcome of the election. One of the most high-profile unionization battles in recent memory is now over, and the labor movement’s enemies are the victors. The UAW’s legal complaint to the National Labor Relations Board (NLRB), filed two months ago, accused Tennessee Republicans and right-wing, anti-union groups of illegally contaminating the election through public statements and threats. In a Monday statement to the press, Bob King stood by that accusation but said the union was no longer interested in pursuing another legal claim. “Even if the NLRB ordered a new election — the board’s only available remedy under current law — nothing would stop politicians and anti-union organizations from again interfering,” according to a UAW statement. King later told Think Progress that the union will continue to organize in Chattanooga, although it remains unclear whether it will try to hold another election. “We’re going to continue to rebuild the majority in Chattanooga, then look at what options are there for us at that point,” he told Think Progress’ Bryce Covert. If the UAW chooses to try again, they can have a second Chattanooga union election next year. King also indicated that UAW is still interested in setting up a German-style works council at the Volkswagen plant. Volkswagen’s Chattanooga plant was supposed to be the UAW’s major inroad to the largely non-union South. At the bottom of the story, Resnikoff included a poll question, "Did outside pressure kill unionization in Chattanooga?" with the options being, "yes," "It played a part," and "No, workers just didn’t want a union." At time of publication, only 33 percent of respondents answered in the negative.